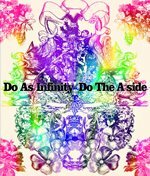 I just received this fantastic double CD from DAI (Do As Infinity) from CDJapan. It also comes with a DVD containing clips from all featured songs. It is a real pity they are no longer together, but this special compilation is a treat for all their fans. I think I already have most songs in other DAI's CD's, and I especially love "Fukai Mori" (end theme for InuYasha), and "Yesterday and Today". This is a must-have indeed! I am delighted. The clips on the DVD are just gorgeous, everything looks like a dream, and all very well produced. Van Tomiko has an exceptional voice and a catchy presence, as do Owatari Ryo and Nagao Dai. They are all so beautiful and talented! All in all, this is an excellent product, with beautiful, top quality presentation, and I am very happy with my purchase. Could not recommend it highly enough! I only wished they had also the clip for "Raven", the ending song for the horror film "Uzumaki" - a very strange film, based on the (also very strange) manga by Junji Ito.